possible to do "patriotic" heroes along the lines of American Flagg and this one — writer Mark Verheiden's succinctly-named The American. The American was introduced in The American #1, published by Dark Horse Comics (Boris the Bear, Sin City) in August, 1987. The character was first seen in person on the fifth page, and was killed on the seventh. But he spent even less time dead than most comic book heroes — he was back alive on the very next page, a reappearance so startling, an 8-year-old witness promptly dropped dead of an apparent heart attack. Unlike many comics characters, the kid was gone for good; and The American, too, died again a little more than a dozen pages later — blown to pieces in a terrorist attack, right in front of TV cameras. The issue ended with an official announcement that despite rumors, The American was fine. This piqued the interest of reporter Dennis Hough, as did the fact that The American had been a popular public icon for more than 30 years. Snide, cynical and rude, Hough teamed up with Dobbs Kelly, formerly The American's kid sidekick, now middle-aged; and with The American himself — or at least, a recent holder of the position — to expose a ruthless government agency, dedicated to perpetuating the illusion of a seemingly eternal hero and heedless of collateral damage, including bystanders, kids who see too much, and the occasional nosy reporter. The American was created by scripter Mark Verheiden, whose other work for Dark Horse includes Timecop and the comic book adaptations of Predator and Aliens. The artist on the first four-issue sequence, in which all the mysteries were worked out, was Chris Warner, who has worked for Marvel on Doctor Strange and for DC on a mini-series in which Predator met Batman. The scenario included comic books going back all the way to The American's beginning in the 1950s; and it was a conceit in the real comic's text pages that these back issues existed in the real world, published by an obscure Canadian company that had very poor U.S. distribution. Obviously, Verheiden took a post-Watergate view of the federal government. Also, according to writer Alan Moore (Miracleman, V for Vendetta), it was the first true post-Watchmen comic book, referring to Moore's own graphic novel which explored the dark side of the superhero concept. Many heroes were "going dark" in response to Watchmen, but in most cases it was only superficial trend-following, adding unsavory elements to the characters almost at random. The American was dark at its very core; but like Moore's story, was driven by a few true (if flawed) heroes. The evil exposed, there followed a "spin" battle, in which the heroes who had brought down the rogue agency, including the sole remaining "American", squared off against its former head — a professional public relations man. And it went on from there, the hero never quite losing his idealistic view of the job even while slogging through the filth that wields power in far too many real-world institutions. 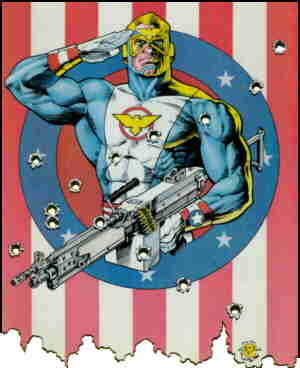 The American continued for eight regular issues, a special, a mini-series, and occasional stories in anthologies, until the mid-1990s. He hasn't been seen recently, but that, like his repeated death, isn't necessarily a permanent condition. Text ©2005-10 Donald D. Markstein. Art © Mark Verheiden.